One of America’s most iconic cities boasts a rich and ongoing Jewish presence, from government service to retail and the world of professional sports. Flying or driving into the Big D, you might not think about its Jewish population. While the city is the nation’s ninth largest, the number of Jews is miniscule: less than one-half of one percent. Yet Dallas, crisscrossed by highways on the flat Texas prairie, with its skyscrapers downtown, gargantuan suburban homes, shopping malls and a metropolitan area of almost 400-square miles, is home to the largest synagogue in the Southwest. Its basketball team, the Dallas Mavericks, is owned by a Jew, and shoppers round the world annually savor the holiday catalog of retailer Neiman Marcus, whose founders were Jewish. Although Dallas dates to 1841, the first known Jewish resident, Alex Simon, set up business in 1858 on what is now Old Red Courthouse square downtown. Simon later relocated to Brenham, Texas. Permanent Jewish settlers didn’t arrive until the 1870s when the Houston and Texas Central Railroad, the Texas and Pacific and other railroads came. Among these residents were gents clothing store founder Emanuel M. Kahn; Alexander and Philip Sanger, whose Sanger Bros. Dry Goods was the largest retail store in Texas; and other merchants whose businesses followed the rails. On July 1, 1872, 11 Jewish men, including Alexander Sanger, founded the Hebrew Benevolent Association to care for the sick and needy; shortly after, they established a cemetery, and that fall they held High Holy Day services in Masonic Hall on Commerce Street. From this institution grew Temple Emanu-El, founded in 1875 and affiliated with the Reform movement. Its first building (1876) was downtown at Commerce and Field Streets; its next (1899-1916) was in south Dallas in a neighborhood of red-brick Victorians known as the Cedars. Little of this fashionable area, where Jewish families lived, remains. The old City Park, however, has been remade into the living history Dallas Heritage Village (1515 South Harwood; 214-421-5141; www.dallasheritage village.org), which portrays life in north Texas from 1840-1910. The village contains Blum Bros. General Store (relocated from Wolf Street, it was the store of German Jewish immigrant Albert Mueller but named now for the fictional Jewish Blum family) and the separate 1901 Blum house (a relocated Plano, Texas, house). Emanu-El’s next home was also in south Dallas, at South Boulevard (a heavily Jewish area) and Harwood Street. In 1957, it moved to its present site at Northwest Highway and Hillcrest Road in north Dallas, where by 1951 the majority of the congregation lived. Rabbis David Lefkowitz (1920-1950) and Levi Olan (1949-1970) were known for their social justice and community-wide initiatives. Lefkowitz also helped create the cross-denominational Kallah of Texas Rabbis, a statewide council founded in 1927. In 1884, in the Deep Ellum neighborhood east of downtown and home to black families and East European Jewish immigrants, 12 Jews formed the Conservative synagogue Shearith Israel. Its first building was at Jackson Street between Pearl and Preston Streets (near today’s Dallas Farmers Market); the congregation later moved near City Park in the Cedars (1920-1956), and then to north Dallas. Families from the Bialystok/Suwalki region of Poland who settled in Goose Valley north of downtown founded the Orthodox Tiferet Israel Congregation in 1890. Their first synagogue was on Akard Street; the congregation later moved to south Dallas and in 1956 relocated to Hillcrest Road in north Dallas. By 1920, Dallas’s Jewish population of 8,000 was less than one-half percent of the total of 159,000, but it was Texas’s largest Jewish settlement. Many department store titans were Jewish: The most famous were Herbert Marcus, his sister Carrie M. Neiman and Carrie’s husband, Abraham Lincoln Neiman, who started luxury retailer Neiman Marcus in 1907. Direct mail became integral to the store’s business, and its catalogs reached a circulation of 1.5 million. Herbert’s son Stanley expanded the business into an international fashion-retailing powerhouse. Jews were also politically involved: 19th-century Jewish aldermen included Alexander Sanger, Emanuel Tillman, Sigmund Loeb and Samuel Klein. In the past 30 years, the Jewish community has contributed three women mayors—Adlene Harrison, Annette Strauss and Laura Miller—Congressman Martin Frost and the first Jewish chairman of the Democratic National Committee, Robert S. Strauss. South Dallas’s Jewish community migrated to north Dallas and the northern suburbs (which include Richardson and Plano and, further north, Frisco and Sherman) starting in the 1940s; the migration continues today. The Jewish population stands at 50,000, and the adult community is made up mostly of professionals, executives, salesmen and business owners. Temple Emanu-El’s membership has grown to over 2,500 families—it’s the largest synagogue in the Southwest—and there are other Reform temples in the suburbs. Conservative synagogue Shearith Israel has 1,400 families on two campuses, the second at 18011 Hillcrest Road. Plano and Richardson also have conservative synagogues. The Orthodox/Traditional Tifteret Israel has 200 families. Several Orthodox congregations have sprung up in Dallas since the mid-1980s, including Congregation Ohr HaTorah. Chabad of Dallas–The Shul (6710 Levelland Road; 972-818-0770;www.chabadofdallas.com) has numerous activities and there are also Chabads in Plano and the Fort Worth area. The Jewish Community Center in north Dallas (7900 Northaven Road; 214-739-2737; www.jccdallas.org) features a fitness center, education offerings for children, adults and seniors as well as cultural programs. The JCC also houses the Dallas Jewish Historical Society (214-239-7120; www.djhs.org). Hadassah has a 2,000-member-strong chapter in Dallas, with offices at 10830 North Central Expressway (214-961-1948;www.dallas.hadassah.org). Jewish schools include Akiba and Yavneh Academy, the Ann and Nate Levine Academy, Mesorah High School for Girls, the Texas Torah Institute and the Torah Day School of Dallas. The weekly Texas Jewish Post covers local news and events. The Texas Jewish Post Guide to Jewish Life/Dallas-Fort Worth (972-458-7283; www.texasjewishspot.com) is a one-stop overview of the community. The Jewish Federation of Dallas operates a hotline for information on all things Jewish in Dallas (214-368-4636;www.jewishdallas.org). If you are planning to spend time in the Jewish community or anywhere outside of downtown, you will need a car to get around as everything is spread out. The old Jewish Dallas is gone but the synagogues built in north Dallas are their own works of art. Temple Emanu-El (8500 Hillcrest; 214-706-0000; www.tedallas.org) has been cited for its striking architecture. Its circular sanctuary features abstract stained-glass windows in blues and greens. On the Ark’s door the blue and green woven fabric echoes the windows’ color, while the silver, gold, blue and green mosaic tiles on the Ark wall become a candelabra when viewed from a distance. Stop by the Tobian Auditorium to see 18 Bible lithographs by Marc Chagall. Shearith Israel recently completed an expansion of its campus at 9401 Douglas Avenue (214-361-6606; www.shearith.org). The synagogue’s new Beck Family Sanctuary opens onto a meditation garden. Shearith Israel also has a far northern satellite, Beit Aryeh, on the campus of the Ann and Nate Levine Academy (18011 Hillcrest Road). The mehitza in the modern Ohr HaTorah (6324 Churchill Way; 972-404-8980; www.ohrhatorahdallas. 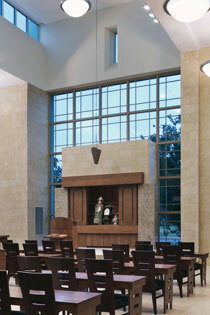 org) on the sanctuary’s second level provides an up-close view of services through its glass-and-wood partition. No Dallas visit would be complete without a trip to the flagship Neiman Marcus downtown (1618 Main Street;www.neimanmarcus.com). Take the elevator to the corporate offices to see photos of the founders as well as old advertising posters. The Dallas Holocaust Museum’s permanent exhibit highlights an attack on a boxcar in Belgium that liberated people en route to the camps; the start of the Warsaw Ghetto uprising; a conference held in Bermuda to discuss the Jewish refugee problem; and what was reported in Dallas-Fort Worth papers. Testimony of local Holocaust survivors is shown in a continuously running movie (211 North Record Street; 213-741-7500; www.dallas holocaustmuseum.org). For many Americans, Dallas is synonymous with the November 22, 1963, assassination of President John F. Kennedy. The moment was captured in a 26-second, 8-mm color film taken by Abraham Zapruder, a Jewish women’s dress manufacturer who worked nearby. Zapruder’s footage—the only complete visual record of the motorcade just before, during and after the shooting—can be viewed at the Sixth Floor Museum (411 Elm Street; 214-747-6660; www.jfk.org). The museum, formerly the Texas School Book Depository and the place from where Lee Harvey Oswald shot Kennedy, explores the events of that day as well as the aftermath through photos, television footage, graphs, charts and a re-creation of the sniper’s nest. Also downtown is the Nasher Sculpture Center (2001 Flora Street; 214-242-5100; www.nashersculpture center.org), an oasis filled with the modern collection of Jewish real-estate developer Raymond Nasher and his wife, Patsy. Wander indoors through the glass-roofed, travertine-clad museum and outside in the sculpture garden to savor works by Alberto Giacometti, Henri Matisse, Raymond DuChamp-Villon and Pablo Picasso. Among Jewish sculptors on exhibit are Jonathan Borofsky, Menashe Kadishman, Joel Shapiro and George Segal. In north Dallas, stop by the indoor NorthPark Center mall, built by Nasher in the 1960s. Scattered among the 200 stores are sculptures from the family’s collection, including ones by Andy Warhol, Claes Oldenburg, Frank Stella, Borofsky and Shapiro. Don’t miss the framed ink-on-silk scarves, including one designed by Chagall, outside the restrooms. At the downtown Dallas Museum of Art (1717 North Harwood Street; 214-922-1200; dallasmuseumofart. org), across from the Nasher, discover Jackson Pollock’s drip painting Cathedral that Stanley Marcus secured in 1950 as a gift for the museum (the painting was then valued at $5,000). The Wendy and Emery Reves Collection—Emery was a Hungarian Jewish publisher and writer—re-creates five rooms replete with European decorative arts and Impressionist paintings from their French villa. The Dallas Museum of Art and the Nasher Sculpture Center, along with the Crow Collection of Asian Art, are part of the Dallas Arts District, America’s largest urban arts district. The JCC hosts an annual Jewish Film Festival in September, and 3 Stars Cinema at the Angelika Film Center (5321 E. Mockingbird Lane; www.3starscinema.org) has monthly screenings of contemporary and classic Jewish-themed films. A yearly Kosher Chili Cookoff to raise funds for local charities is held in March at Tiferet Israel (www.kosherchilicookoff.com). Just 35 miles separate Dallas and Fort Worth, but the two cities have unique histories. Fort Worth developed as a military post and a stop on the Chisholm Trail cattle drive. The Conservative Congregation Ahavath Sholom (4050 South Hulen Street; 817-731-4721; www.ahavathsholom.org) was founded in 1892, while the Reform Beth-El Congregation (4900 Briarhaven Road; 817-332-7141; www.bethel fw.org) traces its roots to 1902. Both began downtown but today are located in southwestern Fort Worth across the road from each other. Fort Worth’s Jewish population is estimated at 5,000. Cultural gems in Fort Worth are within walking distance of each other and a short drive from the synagogues. They include the Kimbell Art Museum (3333 Camp Bowie; 817-654-1034; www.kimbellart.org), the Amon Carter Museum (3501 Camp Bowie; 817-738-1933; www.cartermuseum. org) and the Modern Art Museum of Fort Worth (3200 Darnell Street; 817-738-9215;www.themodern.org). The late television producer Aaron Spelling grew up in Dallas; his Hollywood hits included Charlie’s Angels, Fantasy Island and The Love Boat. Ambassador Nancy Goodman Brinker founded Susan G. Komen for the Cure in Dallas 1982 in honor of her sister, Susan G. Komen, who had died from breast cancer. The organization’s trademark Race for the Cure was first run in Dallas in 1983. Jewish high-tech entrepreneur Mark Cuban owns the Dallas Mavericks of the National Basketball Association. Rose G. Biderman’s They Came to Stay: The Story of the Jews of Dallas 1870-1997 (Eakin) provides an overview of the community’s history, while Gerry Cristol’s A Light in the Prairie (Texas Christian University Press) focuses on Temple Emanu-El’s history. Documentary filmmakers Allen Mondell and Cynthia Salzmann have chronicled events in Texas in Films From the Sixth Floor, A Fair to Remember and West of Hester Street, about emigration through Galveston. Check www.dallaskosher.org for complete kashrut information. Among the kosher eateries in Dallas—all in the north—are Café Carmel (13410 Preston Road; 972-726-9800), Café Fino (7522 Campbell Road; 972-931-9500; www.cafefinodallas.com) and Natalie’s Kitchen & Market (7114 Campbell Road; 972-380-1010). The Tom Thumb supermarket at Preston Forest (www.tomthumb.com) has a large kosher section. The luxurious Cooper Guest Lodge (www.cooperaerobics.com/hotel) is less than a half-mile from Ohr HaTorah and Shaare Tefilla. The lodge discounts rates for synagogue visitors who book in advance. The Fairmont Dallas (www.fairmont.com/dallas) and the Adolphus Hotel (www.hoteladolphus.com) are within walking distance of downtown sights.